HABIT: Many stems from ground growing up and arching over to form a loosely shaped shrub. White flowers in late winter. Bare branches most of winter. CULTURE: Easy to grow in any soil. Drought tolerant. USES: Shrub mass for soft, natural effect. Garden fragrance. PROBLEMS: A little wild looking for formal gardens. Otherwise few problems other than dieback of entire branches especially in harsh winters. NOTES: Bush honeysuckle is a native to Texas but there is great confusion about the plant. It is non- invasive and should be used more often. 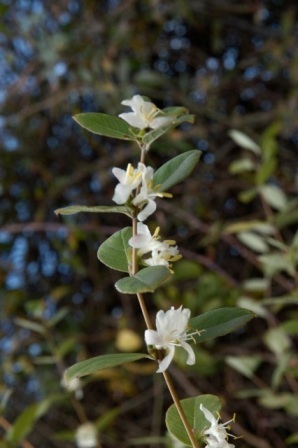 On the other hand L. fragrantissima has sharp pointed leaves and flowers in spring. It is an import that has naturalized in Texas. It is extremely invasive and not a good plant.